ISPmanager is a Linux-based, flexible control panel offered by ISPsystem, a leading provider of hosting automation solutions in Russia. For nearly two decades, ISPmanager has grown to become one of the most popular web control panels in Eastern European nations, with rising popularity in other territories. This powerful panel is offered in two editions; both are equipped to handle unlimited domains and users, and can be customized to meet your branding needs. 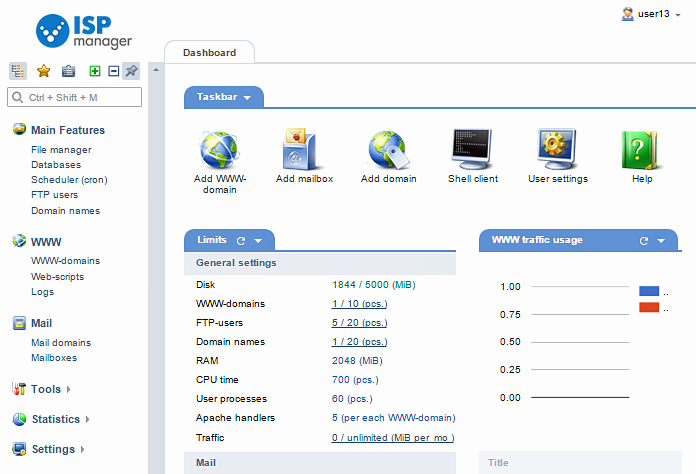 ISPmanager Lite is designed for managing VPSs and dedicated servers. ISPmanager Business is ideal for shared or reseller hosting. ISPmanager is a commercial product with features similar to premium control panels, however, the price point is on the lower end of the spectrum comparatively, so many end users find this option to be a better value. ISPmanager’s rich feature set and affordable cost combination are what make us proud to help introduce the software to the US market. ISPmanager Lite lets you easily manage your personal server and maintain websites. Quickly set up and manage web-servers. 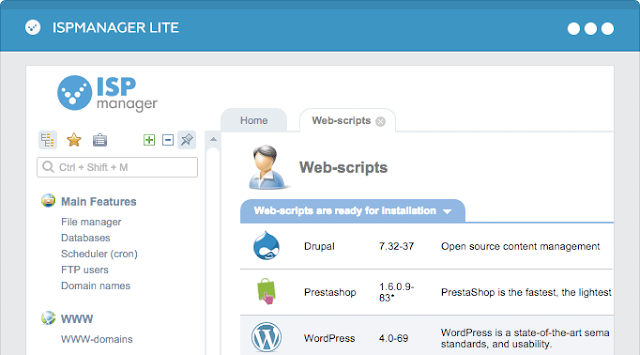 Install popular CMS and create sites. Create and manage accounts, set limits, and grant different permissions. Manage files and FTP users via panel. Set permissions on files & directories. Install SSL certificates on web-servers domains. Manage Firewall. Easily create domain zones and edit domain records. Add your own corporate logo, change colours of panel and website’s link. Create mailboxes, configure aliases and set up mail spam filters. Create and manage web domains. Install SSL certificates on them. Schedule backups to external storage with automatic backup system. Easily create and store databases. Manage user access limits. Set various PHP versions for different domains using built-in PHP-selector.